The OWM powder-painted, ANSI approved, metal attic ladder is assembled in three sections. The OWM is equipped with a locking mechanism that is installed inside the door panel. The length of the ladder may be adjusted within 1 inch after cutting the side rails to set the ladder evenly on the floor. The construction of the attic ladder provides more steps (tread rise about 10 inches) to improve safety and comfort. A red, metal handrail is available for purchase and may be installed on either side of the ladder. Brackets allow adjustments to increase space between ladder and attic door for comfort and safety. Springs are located on door surface to make entry to attic wider and more comfortable (the widest entrance on market - compare to other products). Door is well balanced - it opens and closes easily (NO sudden movements). Fits rough opening 25 in. x 54 in. and ceiling heights 7 ft. 11 in. to 10 ft. 1 in. The LMS powder-painted, ANSI approved, metal attic ladder is assembled in three sections. 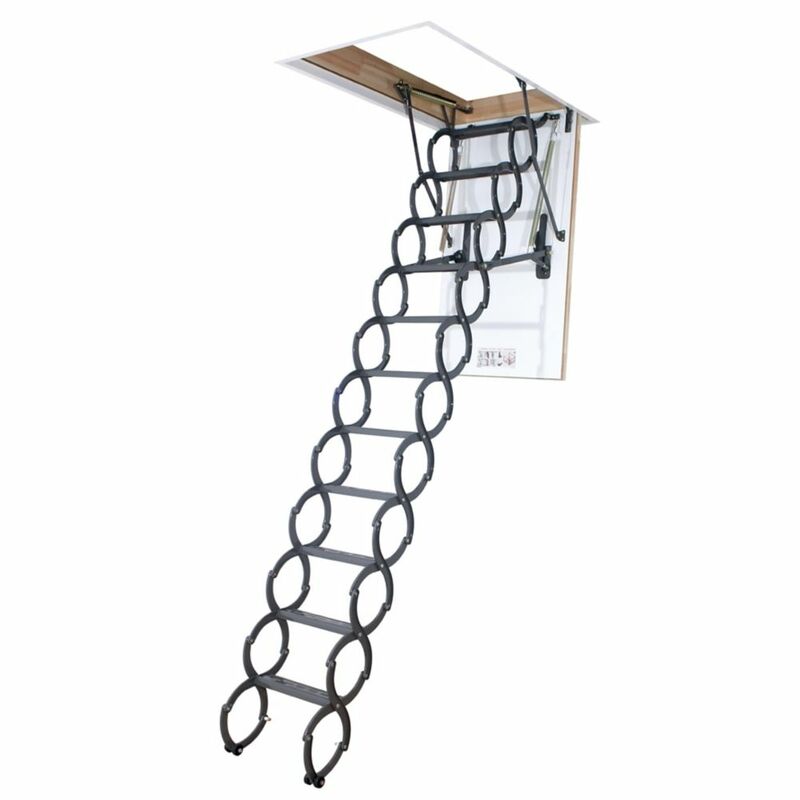 The LMS attic ladder is equipped with locking mechanism that is installed inside insulated and sealed door panel. The length of the ladder may be adjusted within 1 inch after cutting the side rails to set ladder evenly on floor. Construction of the LMS provides more steps (tread rise about 10 inches) to improve safety and comfort. A red, metal handrail is available for purchase and may be installed on either side of the ladder to increase safety and comfort. Brackets allow increasing space between ladder and attic door for comfort and safety. Springs are located on door surface to make entry to attic wider and more comfortable (the widest entrance on market - compare to other products). Door is well balanced - it opens and closes easily (NO sudden movements). Fits rough opening 22 1/2 in. x 54 in. and ceiling heights 7 ft. 11 in. to 10 ft.1 in. LST 9 ft. 6-inch, 22.5-inch x 31-inch Insulated Steel Scissor Attic Ladder with 350 lb. Capacity Fakro LST Scissor Attic Ladder is made from powder-coated quality steel and hand selected pine. Fully assembled unit is nicely finished with attention to detail and is ready to install. Well balanced scissor system ensures safe and easy operation and delivers 350 lbs. load capacity. The ladder unfolds and folds with minimum force and no sudden movements. Standard ladder length can be adjusted by adding or removing step segments, where each step is adding 8-inch to a ceiling height (step model # LSS 31, max. two steps). Offering a unique, modern appearance in a simple design, the S-shaped steps also conveniently serve as handrails while climbing. LST 9 ft. 6-inch, 22.5-inch x 31-inch Insulated Steel Scissor Attic Ladder with 350 lb. Capacity is rated 4.2 out of 5 by 33. Rated 2 out of 5 by Joe from The ladder works great and install is easy. The edges of the door easily chip, which makes this ... The ladder works great and install is easy. The edges of the door easily chip, which makes this door look extremely cheap. Since I've installed it the chip continues to flake off, making it look even worse. If I could cut this door out and return it, I would. Rated 4 out of 5 by Charles from beautifully made attic ladder , only down side is the opening is a little tight . beautifully made attic ladder , only down side is the opening is a little tight . Rated 4 out of 5 by TR from The stairs are very solid. The weakness I encountered was... The stairs are very solid. The weakness I encountered was the white laminated bottom surface that’s visible from the living space. It is very easily damaged in transit or during installation. Rated 4 out of 5 by GT from Compact ladder system was straightforward to install, opens & closes well and stairs are sturdy. ... Compact ladder system was straightforward to install, opens & closes well and stairs are sturdy. Be sure to have three people on hand when positioning stairs. Aside from the, it was a one-person installation. Rated 5 out of 5 by kyleman from Project went as planned. Project went as planned.